Loan growth in the US continues to slow. Credit expansion is certainly not nearly as bad as what has transpired in the Eurozone (discussed here), but the slowing trend is unmistakable. The current rate of loan growth is now significantly below the nominal GDP expansion. One exception may be the corporate sector, where loan growth has been robust (see story). But as percentage of banks' total balance sheets, business loans are not growing. In fact much of the corporate debt growth is actually coming from outside the banking system (see post on shadow banking). Many expect that bank balance sheets will remain constrained by the new regulatory framework (Basel II, etc. ), with loan growth continuing to stay weak. 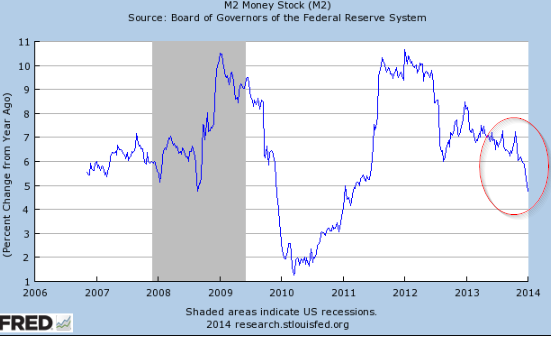 As a result, the increases in US broad money supply (M2) have slowed as well. This is one of the reasons inflation in the US has been subdued in spite of massive injections of liquidity by the Fed.